Revis. Gen. Pl. 1: 260. 1891 [5 Nov 1891] Remarks: nom. nov. for Mammillaria geminispina Haw. non DC. 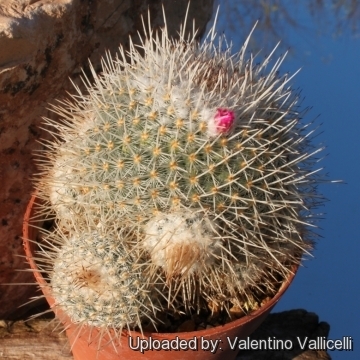 Accepted Scientific Name: Mammillaria geminispina Haw. Growing habit at Metztitlan, Hidalgo, Mexico. This Mammillaria gets only better looking with age. It will continue to put on more and more heads, as well as more white cotton topping. The heads form mounds that seem stacked on top of each other. Origin and Habitat: Guanajuato, Hidalgo, Querétaro, San Luis Potosí and possibly Veracruz. Mexico. Altitude: 1000 - 1850 metres above sea level. 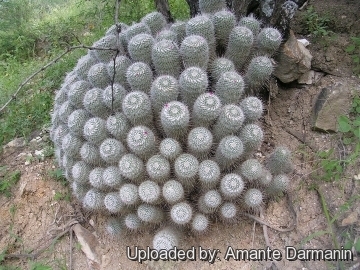 Habitat and Ecology: This species is found in xerophyllous scrub on calcareous soils on rocky hills, together with Cephalocereus senilis, Gymnocactus horripilus, Mammillaria schiedeana, Mammillaria wildii, Astrophytum ornatum, Gymnocactus horripilus, Selenicereus spinulosus, Ferocactus glaucescens, Cephalocereus senilis, Stenocereus dumortieri, Fouquieria purpusii, Brahea dulcis, Echeveria coccinea, Tillandsia grandis, Hechtia podantha, Agave stricta and Agave xylonacantha. It forms colonies. In appropriate habitat the species is abundant. Historically the species was overcollected, however today this threat has been reduced. Mammillaria geminispina var. brevispina (Hildm.) Backeb. 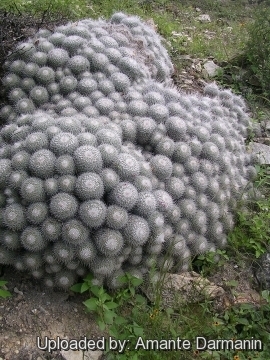 Mammillaria nivea var. brevispina Hildm. Mammillaria geminispina var. monacantha Lem. & Monv. Mammillaria geminispina var. nobilis (Pfeiff.) Backeb. Mammillaria bicolor var. nobilis (Pfeiff.) C.F.Först. Mammillaria geminispina var. tetracantha Lem. & Monv. Mammillaria albata var. longispina Repp. Mammillaria albata var. Repp. Repp. 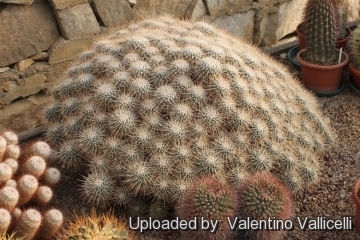 Mammillaria albata var. sanciro Repp. Mammillaria geminispina f. alba hort. Mammillaria geminispina f. nivea hort. 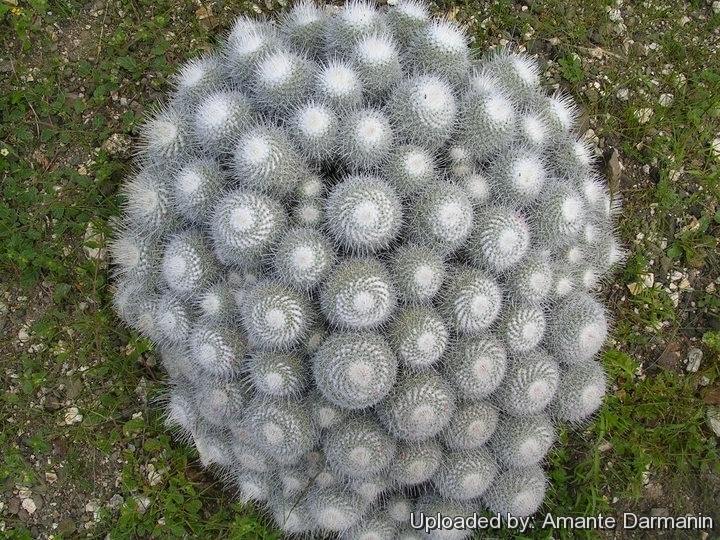 Description: Mammillaria geminispina is a highly variable densely spined species. Some cluster aggressively and form 30 to 90 cm large clumps that appear white, while other seem to stay more solitary. Stem: Short cylindrical, light green whit latex, up to 18 cm high and 8 cm in diameter. Tubercles: Rounded with latex. The axil is filled by white wool and 10 - 20 long white bristles. 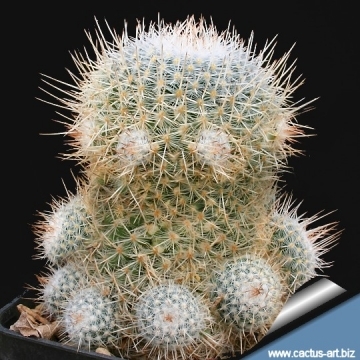 Spines: Spines are variable too, some plants have very short while others have long spines. Central spines: 2 (to 6) pure white or white with dark tip that protrude far out from the rest, straight or slightly curved, 0,5 to 4 cm long (or more). Radial spines: 16 to 20 chalky white, interlacing up to 7 mm long. Flowers: Campanulate, pinkish to carmine red, with darker midveins, to 20 mm long and in diameter usually in a ring in the growth of the previous year but sometime more randomly over the body. If grown from seed, M. geminispina can take seven to eight years before flowering. Mammillaria elegans DC. 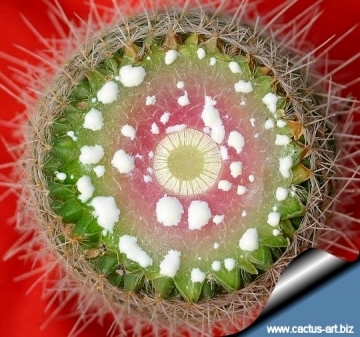 : is a 'nomen confusum' (confused name) applied bolth to Mammillaria geminispina with latex in the stem and to Mammillaria haageana, without latex in the stem. Mammillaria geminispina Haw. : (var. geminispina) it has 2 central spines of different length, white with darker tips. Mammillaria geminispina var. brevispina (Hildm.) Backeb. : form with 2 short darker tipped central spines. Mammillaria geminispina subs. leucocentra (A.Berg) D.R.Hunt: With 5-6 pure white central spines. Mammillaria geminispina var. monacantha Lem. & Monv. : Form with only one central spine. Mammillaria geminispina var. nobilis (Pfeiff.) Backeb. : This is one of the best forms with very long central spines that are of the same lenght. Mammillaria geminispina var. tetracantha Lem. & Monv. : Form with 4 central spines. 6) Gómez-Hinostrosa, C., Sánchez , E., Guadalupe Martínez, J. & Bárcenas Luna, R. 2013. Mammillaria geminispina. In: IUCN 2013. "IUCN Red List of Threatened Species". Version 2013.2. <www.iucnredlist.org>. Downloaded on 16 March 2014. Cultivation and Propagation: It is a fairly easy plant to grow, don't requires any special treatment, but need as much light as possible without burning the plant to encourage the heaviest spine formation, if kept too dark it may become overly lush and greener and could be prone to rotting due to over watering. During the summer it is best to keep the plants outside where the temperature can rise to over 30 C with no harm to the plant. Furnish good drainage and use a an open and free draining mineral compost that allows therefore roots to breath. They like only a short winter's rest and should be kept almost completely dry during the winter months, If the soil is allowed to be dry for too long root loss could follow but equally the same result would occur if the plants are both wet and cold. From March onwards the plant will begin to grow and watering should be increased gradually until late May when the plant should be in full growth. Propagation: Seeds or by stem cuttings from adult plants.